Surfboard riding in Australia was given massive impetus with the tour of Hawaiian expert, Duke Paoa Kahanamoku, in the summer of 1914-1915. 1. Surf riding is not something new but has an ancient tradition, historically comparable with the Greek Olympics. 2. Surfboard riding is not limited to the benign waves of Waikiki. - wave knowledge, safety and rescue. - instruction, including tandem lessons. - surfboard construction and design. - the principles of the hand shaping. and demonstrated by a surfing performance that would not be eclipsed in Australia for 40 years. 4. Apart from breaking several current world swimming records, the tour had a significant impact of the continuing development of modern swimming technique. 5. For Australian society, Duke Kahanamoku's visit brought into question some commonly held views of racial superiority. Note that for many commentators it has been all too easy to date the beginnings of surfboard riding in Australia to Duke Kahanamoku's 1914-1915 visit, whereas the previous chapter demonstrates that this was not the case. -see Before Duke 1900 - 1914. Probably the most influential work has been Nat Young's History of Surfing where he noted the arrival of C.D. Paterson's board in 1912 which "a few local body surfers had tried to ride, but couldn't" (page 42), and accredits a photograph on page 47 as "15th January 1915 Duke Kahanamoku introduces surfboard riding to Australia." The book has had numerous editions, the latest in 2009, each new edition adding an extra chapter, without the early chapters ever being revised. 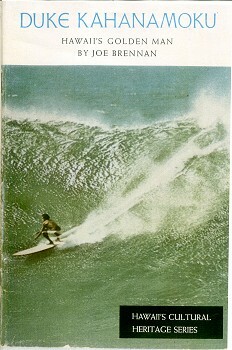 - Young: The History of Surfing (1983) and subsequent editions. As is often evident in recording history, the story teller may have a vested interest in securing a position of prominance for a compatriot, a family member, their club, their association, or themselves. I Iearnt on Duke Kahanamoku's board, which he left here after introducing surf-board riding to Australia before the war." - Daily Telegraph Thursday, 9 February 1939, page 7. "A spectacular event was the arrival of a raft from the sea manned by supposed survivors of a shipwreck. As they came in on the surf, they were attacked by a band of cannibals from the beach and just in the nick of time were rescued by a man-o-war crew in the surf boat. There was much firing of guns and several of the niggers dropped as though shot. The proceedings were -julie (?) realistic and the event brought forth rounds of cheers from the spectators." - Unaccredited: Manly Surf Carnival. Sydney Morning Herald, 21 March 1910, page 10. 1912 Olympic Games, Stockholm, Sweden. Following his victory in the Olympic 100 metre sprint in 1912 over Australian swimmers Cecil Healey (second place) and William Longworth, the manager of the Australian swimmers, Mr. A.C.W. Hill, approached Duke Kahanamoku (as well as several other world class swimmers) with the prospect of a future competitive tour of Australia. "Kahanamoku ... was willing to come, indeed anxious to make the trip to Australia." - Merman (W. F. C. Corbett): Wonderful Hawaiian - Duke Paoa Kahanamoku. The Daily Telegraph, Sydney, 30th October, 1912, page ? This document was provided courtesy of Ray Moran at the Australian Surfing Museum and Manly LSC. Duke's enthusiasm to tour Australia was perhaps in no small way enhanced by an outstanding act of sportsmanship by his closest rival, Cecil Healey, who along with others, consented to a 100 metre repercharge after Duke Kahanamoku and other members of the American team had failed to show for their event. In October, 1912, a meeting of the NSW Amateur Swimming Association initiated a formal invitation to Kahanamoku to compete in various state championships and demonstrate his progressive swimming style. A newspaper article reported on Duke's unusal first name, education, his rise to competitive prominance and swimming technique. Duke's surfriding skills were also noted. 30th October, 1912, page ? Unfortunately the invitation presented administative and logistical difficulties, and tour did not eventuate for another two years. Duke's Olympic success had created a demand for demonstrations of his skills and in the following years he appeared at several events in America, on occassions demonstrating surfboard riding and setting a precedent for the events later organised in Sydney. "The great Hawaiian swimmer and six members of the Hawaiian team spent several hours in Long Beach yesterday. They came upon the invitation of Pete Lenz. They couldn't resist the surf and the Duke gave a thrilling exhibition of surfboard riding. Thousands of people enjoyed watching him." - Unaccredited: Local Boy Races Champ. Daily Telegram, 12 July 1913. "Mr. W. W. Hill, secretary of the New South Wales Rugby Union, Australian Swimming Union, Olympic Fund Committee, and general all-round sporting enthusiast, returned to Sydney yesterday by the R.M.S. Niagara, after a brief visit to California." Mr. Hill visited Honolulu, on his way home, to interview Duke Paoa Kahanamoku, the famous Hawaiian world's champion sprint swimmer, in regard to a visit to Australia. Unfortunately, the "Duke" has some urgent private business to attend to. When at Honolulu, Mr. Hill mastered the art of surf-board riding, and canoeing in front of the wave; which sport is made possible by the formation of the Waikiki Beach, which brings in a long easy roll. 'There are some fine swimmers at Honolulu besides Kahanamoku,' continued Mr. Hill, 'and the Hawaiian Athletic Union wants to send a team to Australia next season. George Cunha is the best, and has swam 100 yards in 57 seconds.' "
- Unaccredited: Football in America - Mr. Hill Returns. Sydney Morning Herald, Tuesday 23 December 1913, page 4. The next week, the Sydney Morning Herald published an extended article on Waikiki Beach and Kahanamoku's swimming acheivements, which although unaccredited, was probably by W. W. Hill. "The experience is very pleasant; and, once the art is mastered, everything is forgotten in the keen enjoyment of the exercise." "He should easily acclimatise and the temperature of the water and surroundings generally, should be in the champion's favour when he visits us in December next." - (W. W. Hill): The Home of the Board Surfer - An Australian's Impressions. Sydney Morning Herald, Wednesday 31 December 1913, page 5. 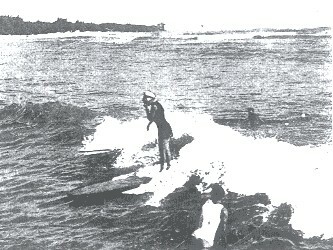 It is likely that Hill's surfriding experiences at Waikiki and these newspaper articles, to some extent, contributed to an expectation that Duke would replicate his boardriding skills when he arrived in Australia. With arrangements formalised for a tour of Australia and New Zealand, Kahanamoku left Honolulu aboard RMS Ventura on the 30th November 1914, accompanied by 19 year old surfer/swimmer George Cunha and manager Francis Evans. The Referee, 2 December 1914, page 11. George Cunha was possibly a member of the Outrigger Canoe Club and/or the Haui Nui Club, Waikiki. Obliquely, one of the many surfing breaks at Waikiki is called Cuhna Surf. 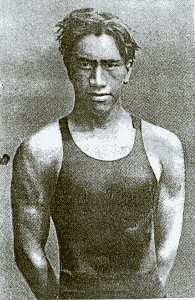 Unfortunately, despite accompanying Kahanamoku on several American tours, a substantial competitve record, and significant swimming performances while in Australia, there are no Australian reports of his boardriding skills, although Cuhna did compete in an alarm reel race in the surf at the Cronulla carnival on the 7th February 1915. The St. George Call, 13 February 1915, page 5. - Unaccredited: Swimming - Kahanamoku v Longworth. Sydney Morning Herald, 26 January 1915, page 10. Retrospectively, New Zealand's Poverty Bay Herald recalled in December 1915 that at Lyall Bay both Cunha and Kahanamoku gave an "exhibition of the art of riding the surges". Poverty Bay Herald, Volume XLII, Issue 13875, 24 December 1915, page 2. The role of George Cunha remains an untold story in the surfriding exhibitions of 1914-1915. Francis Evans replaced Mr W.T. Rawlins, president of the Hawaiian Amateur Athletic Union, who was initially to lead the tour. - Unaccredited: Kahanamoku and Party. Sydney Morning Herald, 9 December 1914, page 6. "As the due date of his arrival (Monday next) draws nigh, so does the excited state of enthusiasts' feelings become more apparent." - Cecil Healey: Kahanamoku, World's Swimmer Expected in Sydney Next Week. The Referee, 9 December 1914, page 1. Not only swimmwers, but local surfriders had reason to be excited about the Hawaiian's visit. Aware of Kahanamoku's world wide fame as a surfboard rider, probably aware of Duke's surfboard riding exhibitions in California and possibly enhanced by the experience of W.W. Hill at Waikiki in 1913, while the Hawaiian visitors were in transit arrangements were already in motion to have Duke Kahanamoku perform similar feats while in Sydney. "An arrangement is being completed by which opportunity will be given to surf patrons to view his work with the board on our ocean beaches." - Unaccredited: Swimming - Kahanamoku's Visit. Sydney Morning Herald, Wednesday 2 December 1914, page 6. 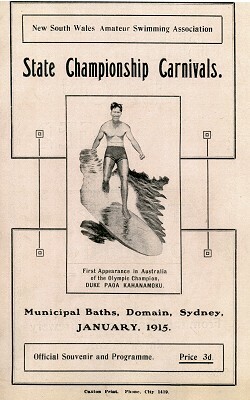 The New South Wales Amateur Swimming Association prepared advertising posters promoting his appearance at events on the 2nd, 6th and 9th January, 1915, which featured Duke Kahanamoku's surfing prowess and were variations on the surfriding image used on advertising for the Mid-Pacific Carnival at Honolulu in early 1914. The original poster was based on a 1912 photograph by A. R. Gurrey Jr., see above. Kampion: Stoked (1997) page 38. Arrival in Sydney, 14th December 1914. A reception committee comprising James Taylor, E.S. Marks, W.W. Hill, C.D. Jones, and W.W. Scott was appointed to provide an official welcoming for the party. As previously noted, Hill had met with Kahanamoku twelve months earlier in Honolulu. A large number of officials, press and public were at the whalf when RMS Ventura docked in Sydney about 1 pm on 14th December 1914. 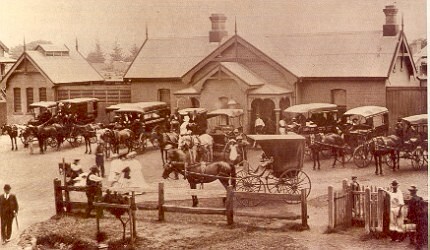 The party was transported to their accommodation at the Oxford Hotel, inspected facilities at the Domain Pool, and then attended an official reception at the Hotel Australia. The day after the arrival of the Hawaiian competitors, the Sydney Morning Herald published profiles of Kahanamoku and Cunha, an account of the official welcome, and a projected itinerary. "Duke Kahanamoku said he had been looking forward to this visit for the last two or three years." "Victoria, on the score of expense, has declined a visit." Following previous announcements (SMH, 2 December 1914, page 6) plans were in train to present surfriding exhibitions, but only after appearances at the swimming carnivals in Sydney and Brisbane. "After the Sydney swimming carnival, the champion goes to Queensland, where he will appear at several towns. - Unaccredited: Kahanamoku - Champion Swimmer Arrives. Sydney Morning Herald, 15 December 1914, page 4. Cecil Healey reported on the official reception for The Referee. "The tourists were officially welcomed at the Hotel Australia at 5 o'clock on Monday afternoon. The guests were recorded a magnificent reception, the hero of the occasion, Duke, of course, being specifically signalled out." - Cecil Healey: The Duke Reaches Sydney. The supposed ban on surfboard use was possibly communicated by Alexander Hume Ford, the founder of the Outrigger Canoe Club at Waikiki, who visited Australia in 1908 and apparently was given this impression. "(At Manly) I wanted to try riding the waves on a surf-board, but it was forbidden." Although often reported, there never was an outright ban on using surfboards in Sydney, however there were government regulations restricting their use when considered dangerous to surf bathers. two hours after his arrival in Sydney." 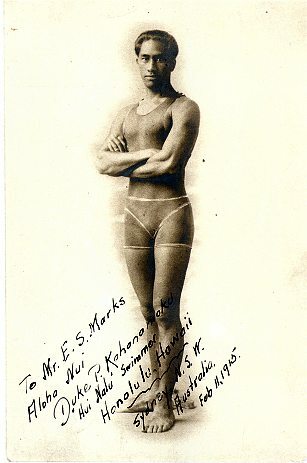 "GEORGE CUNHA, SECOND ONLY TO KAHANAMOKU AS SWIMMER IN HAWAII. and can do 100yds in 57sec. He is one of the Honolulu party now in Sydney." - Unaccredited: Swimming Notes. The Referee, 16 December 1914, page 11. Randwick and Coogee Gala, 16th December. Two days after arriving, the touring party attended the Randwick and Coogee Gala as guests, and were also scheduled to make a similar non-competitive appearance at the annual Sydney- Melbourne contest on Saturday, 19th December. "They are members of the Hui Nalu Club, and the party will attend the Randwick and Coogee gala to-night, and the Sydney-Melbourne contest on Saturday." - Unaccredited: Swimming- Kahanamoku's Arrival. The Sydney Morning Herald, Wednesday 16 December 1914, page 6. Duke's Freshwater Surfboard, 20-21st December. with Duke's 1912 Waikiki board, above. * Not the same photograph, but certainly taken within minutes of each other. Sometime during this week, with no competitive duties, Duke Kahanamoku was acquainted with Australian surfing enthusiasts at Manly and Freshwater Beaches. He was accommodated at Boomerang Camp, Freshwater, were he could experience Australian beaches and hopefully exhibit his renowned surfing skill. By this time body surfing had become common on Australian beaches, actively promoted by the Surf Life Saving movement, and although boards were being used in the surf there was some doubt that Duke would be able to replicate his Hawaiian performance in local conditions. Whereas in ancient Polynesia the surfriding elite were largely members of the royal class who, presumably, rode surfboards built by artisan canoe builders; in the twentieth century, in a tradition beginning with Duke Kahanamoku, elite riders were at the forefront of board design and construction. - Finney and Houston: Surfing (1996) pages ? A surfboard billet in sugar pine (Pinus lambertiana) was hastily prepared, which may have had the template cut before Duke, “proving himself a fine craftsman”, prepared the rail and bottom shape, according to one report with a concave section in the bottom. - Maxwell: Surf (1949) page 236. - Harris: Manly LSC (1961) page 54. After shaping, the board finished at 8 foot 8 inches long and 23 inches wide. - These dimensions personally measured at the Freshwater Surf Life Saving Club, 2005. The Daily Telegraph, Friday 25 December 1914 , page 7 reported: “8ft. in length, 3ft. in width”. In Nat Young's Book of Surfing (1979) and his Surfing Fundamentals (1985) the dimensions are noted as 3.6 m x 61 cm x 7.5 cm x 31 kg (11 ft 10" x 24" x 3" x 68.3 lbs.). Longboarding Magazine, Edition 18, November - December 2001, page 35. Reprinted in The Best of Tracks, 1973, page 191. Sugar pine was not the preferred timber for Hawaiian board building. “The board used by Kahanamoku weighed 78lb, and was sugar pine. He would have preferred redwood, but a properly seasoned piece of that particular timber, sufficiently long, could not be procured in Sydney. - W. F. Corbett: Wonderful Surfriding- Kahanamoku on the Board. Note there is considerable variation in the reported dimensions, for example the surfboard weight in this and the subequent reports. “Then too, Kahanamoku was at disadvantage with the board. - Unaccredited: Surf-Board Riding : Kahanamokus's Display. Sydney Morning Herald, 25 December 1914, page 7. - Harvey: Surfing History of Queensland (1983) page 8. Downing, a trainee architect, may have also been responsible for drawing up plans for the solid wood board printed and widely distributed by the Surf Life Saving Association of Australia. - SLSAA: Handbook (1932) page 169. While the board has immense historical significance, it is likely that other boards subsequently shaped in Australia by Duke were the actual models upon which local builders based their designs. "we've already ordered a board each … and we are going to master that game beyond any other." - W. Corbett: Kahanamoku in the Surf. There is an implication that these boards are to be ordered directly from Kahanamoku. A report in the Sydney Morning Herald implies there were several boards built during January and may have included one shaped by Duke’s companion, George Cunha, although this is the only currently known reference to his association with surfboard riding during the tour. Presumably, there were vigorous attempts to secure seasoned redwood billets of suitable dimensions to build these later boards, one of which made its way to Cronulla, the property of ex-Manly surf-shooter, Ron “Prawn” Bowden. "The Duke's board later became the property of noted club member, Ron "Prawn" Bowden, who sold it to Fred Locke, who in turn, signed it over to the inimitable Jack McTigue." - W.G. Marshall: The Cronulla SLSC Story, Part 2. Volume 1 Number 2 January, 1968, page 7. It is posssible that the board ridden by Kahanamoku at Cronulla, 7th February 1915, was not the Freshwater board, but another shaped from redwood for the occassion. Winniman: Vintage Surfboards (2008), pages 10 and 11. While Alfred Roy Horden was noted for his "exuberance and recklessness", there is no record of his surfriding exploits in the family's authorised history and it is reported that he enlisted in the army in September 1914, several months before Duke arrived in Australia. - Lesley Horden: Children of One Family. Retford Press, Sydney, 1985, pages 219 and 334. If the board was not gifted, as claimed, certainly the Horden family were financially capable of paying the high price these boards no doubt fetched. However, their connection with surfriding at Palm Beach is not established until 1921 and at this time they had the facilities to have surfboards constructed by in-house cabinet makers such as Buster Quinn. - Brawley: Palm Beach SLSC (1996) pages 12-13. Ideally, this board’s provenience awaits further documentation. 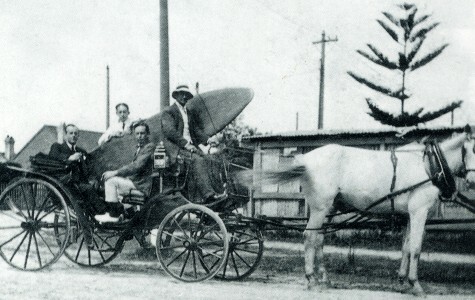 It is possible that Duke the test rode his sugar pine board during the week before the first exhibition at Freshwater. - Curlewis, Adrian: Notes on surfboard riding prepared by S.L.S.A., circa 1948, page 2. Claude West, a youth of 15 at the time of Kahanamoku’s visit, became the leading local surfboard rider. Originally a member of Freshwater SLSC, he later moved to the Manly club. on to another Manly club member, “Snowy” McAlister. Claude West donated the board to the Freshwater SLSC in 1953 where it remains to this day. in Myers: Freshwater LSC (1983) page 56. The Non-Exhibition, Wednesday 23rd December 1914. "The New South Wales Swimming Association has arranged for a display by Duke Paoa Kahanamoku at Freshwater on Wednesday morning, at 11 o'clock. - Unaccredited: Swimming - Surf Display by Kahanamoku. Sydney Morning Herald, 22 December 1914, page 12. Clearly the swimming officials were aware of the construction of the Freshwater board and its (probable) test riding in the previous week for such an announcement to be made. While the NSW Swimming Association arranged this exhibition to promote the upcoming swimming carnivals on the back of the Duke surfriding image used in their promotional material (see above), it was intended to be a private demonstration for the local press, and not a public performance. Since they had Duke Kahanamoku under exclusive contract and were promoting his first public appearance as 2nd January at the Domain Municipal Baths, the press announcement was considered regrettable and the event was cancelled. Duke and his board did not make an appearance, much to the disappointment the sizable crowd. "The swimming authorities have heard that through the publication of a paragraph yesterday to the effect that Kahanamoku would give an exhibition in the surf at Freshwater, Manly, some 2000 or 3000 people who assembled there to watch the show were disappolnted. The famous Hawaiian did not put in an appearance, and he was not expected to do-so by those controlling his visit to this country. The association wishes it to be made known that the "Duke's" first appearance in public will take place on the opening day (January 2) of the championship carnival at the Municlpal Baths, Domain. The announcement of any other arrangement with Kahanamoku as the central flgure has not that body's authority." - W.F. Corbett: Fast Swimming - Kahanamoku Did Not Show. The Sun, December 23, 1914, page 5. Writing a week later Cecil Healy confirmed that the exhibition was only intended as a private demonstration and the public announcement that attracted a large crowd caused the event to be postponed. "Representatives of the Press were invited to witness a private exhibition of surf-board riding by Kahanamoku at Freshwater on Thursday. It was to have been the previous day, but the intention accidentally became public property, and as several thousand people were attracted to the vicinity, Association officials decided to postpone it." - Cecil Healey: Swimming ... Kahanamoku and Surf Board. The Referee, 30 December 1914, page 16. The First Freshwater Exhibition, Thursday 24th December 1914. Following the debacle of the non-demonstration on Wednesday, the event was re-scheduled for the following day, Thursday 24th December. However this was not widely publicised and as originally intended, was for the benefit of members of the press. Since it was not promoted as a public demonstration and did not infringe on the exclusivity rights of the NSW Amateur Swimming Association it severed to mitigate any ill-feelings between the swimming authorities and press. While it was a resounding success for the vested interests, those members of the public who had made the effort to attend on the Wednesday may have felt some displeasure when it was subsequently reported in the Sydney newspapers..
"One could hear , in the imagination the roars of applause with which thousands of Australians might have greeted Kahanamoku 's display at Freshwater, Manly, this morning , had the fact that it was to take place been made public. As it was there were only a few pressmen, some members of the New South Wales Amateur Swimming Association, and the casual Freshwater bathers present." - W.F. Corbett: Wonderful Surfriding- Kahanamoku on the Board. The Sun, Thursday 24th December 1914 page 6. "Kahanamoku's control of the improvisation was wonderful, he handled it like a toy and went out fully a quarter of a mile, riding some breakers and dashing through others with such speed that he completely mystified Messers. W. W. Hill and Hoy (sic), who entered the water with him. Not at any time in the race seaward did either of the swimmers hold the islander for a moment, and he soon away by himself." 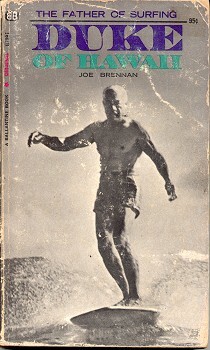 "Hoy" is undoubtedly a printing error and refers to Harry Hay who would have a long term relationship with Kahanamoku. "(He) ... caught the breaker he wanted , and paddling along for a while rose to one knee first, then became gradually erect and reached the crest to shoot foreword with astonishing speed and marvellous balance considering the troubled condition of the motive power. Always was the nose of the raft, if it might be so called, kept tilted upwards, whether while shooting or forced against the breakers. When the surf rider found his board hanging he stooped and paddled till it darted forward once more. Twice he managed to traverse 100 yards or more, and several times 20 or 30 yards were covered. As showing how much second nature it was to him, Kahanamoku stood on his head a couple of times, and even turned his back to the direction in which he was going, and posed. Lying flat on the board, the Hawaiian caused it to describe a half-circle or turn completely round without spoiling the shoot." The next day similar enthusiastic articles appeared in the morning papers. While The Telegraph article was brief, it was accompanied by a photograph of Duke cutting left on a substantially sized wave in what is clearly less than ideal conditions. The report doubled the length of the longest ride and noted that several local surfers attempted to ride the board. "On one occassion, however, Kahanamoku negotiated fully 200 yards before he turned. He also performed some acrobatics, and once stood on his head on the board. Several enthusiastic surfers amoungst the spectactors endeavored to emulate the feats of the Hawaiian, but mostly the board either shot from under them or turned over." - Unaccredited: Acrobatics in the Surf. Daily Telegraph, Friday 25th December 1914 page 7. Image below. "On a couple of occassions he managed to shoot fully 100 yards and then he cleverly demonstrated what could be done. He turned completely round, then lying flat on the board, he raised himself on his hands and swung the board from front to back and back to front, finally again standing straight up." - Unaccredited: Surf-board Riding : Kahanamoku's Display. Sydney Morning Herald, Friday 25th December 1914 page 7.
surfboard riding in Sydney it is sure to be keenly appreciated." Six days after the Freshwater demonstration, another article appeared in the Referee (which was published weekly) but unfortunanely the Kahamamoku's Olympic rival and journalist, Cecil Healy, was not in attendence and his report is largely based on the previous accounts. "A number of our leading surfers were spectators of the display, and from what I can gather the general impression amoungst them was that he did wonderfully well under the circumstances, but they feel sure it merely amounted to an indication of what he is capable of doing under more favorable conditions. They have no doubt that when he has the opportunity to adapt himself to the vagaries of our surf, and strikes a suitable day, he will be able to do things of a really sensational nature." - Cecil Healy: Swimming ... Kahanamoku and Surf Board. In the many published accounts of the Freshwater exhibitions the correct dates have eluded most (all?) commentators, many adopting a flexible "summer of 1915". In his excellent Surfmovies (2000) page 22, Albie Thoms came close by nominating "11.00 am Wednesday 23" for the first private exhibition, unfortunately based on the Sydney Morning Herald announcement for what proved to be the cancelled event. Manly Baths, Friday 25th December 1914. Swimming Demonstration, Schoolboy's Carnival, Domain Baths, 28 December 1914? Domain Carnivals, Saturday 2nd and 6th January 1915. On the back of the widespead publicity generated by the Freshwater surfboard riding exhibition, the NSW Amateur Swimming Association continued to use Duke's surfing to promote their swimming events. The swimming carnivals were an outstanding success, with the venue filled to capacity. CHAMPIONSHIP AT THE DOMAIN BATHS YESTERDAY. The Sun, 3 January 1915, page 5. Despite Kahanamoku being defeated by Tommy Adrian in the 440 yards at the first carnival, on the 6th January his win in the 100 yards sprint was outstanding, creating a new world record of 53 4/5 seconds. The record was reported world wide, including an article in the New York Times. "The visitors were not such accomplished speakers as swimmers, though it is possible that Messrs. Kahanamoku and Cunha are gifted enough when they speak in the native tongue, for no one present was able to interpret the compliments they gave voice to with wreaths of smiles. Though all present did not hear this clearly, it was a remarkably popular innovation and led to an encore." -The Cynic: A Few Remarks on Swimming. The Referee,13 January 1915, page 15. Interview with W. F. Corbett, Thursday 7th January 1915. Following his world record performance, Duke had an extended interview with W.F. Corbett, which was printed the next day in The Sun.
" 'Surf shooting is a new pastime here,' said he. 'With us it is old - as old as the hills, perhaps. Shooting on a board and in a canoe must have started further back than body shooting." "You have hundreds more surf shooters at work in one day around Sydney than we see in a week, or perhaps a much longer stretch of time, at Honolulu, but I think the old island has the pastime at greater perfection, which is only to be expected considering its antiquity with us." "(At Waikiki) the facscinating sports of surf-canoeing and surf-board riding are indulged in by man, woman, and child, who insist that they have the most exhiarating and fascinating pastime known. The board is worked on the same principle, but its control calls for much greater skill." It was with the few I delighted to be." "Before starting for the 100 yards championship of New South Wales last Sunday afternoon Kahanamoku could only plug one ear. It would not have paid to be deaf to the starter's signals." - W.F. Corbett: Kahanamoku Talks. The Sun, Friday 8th January 1915 page 6. Freshwater and Manly Exhibitions, Sunday 10th January 1915. With the completion of two highly successful swimming carnivals, Duke was again in residence at Freshwater and on Sunday 10th January gave two exhibitions comprising both surfboard riding and body surfing. 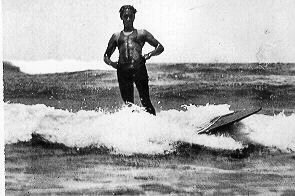 "Kahanamoku, the Hawaiian swimmer visited Freshwater yesterday morning, where he gave some fine displays of surf-shooting. In the afternoon be treated the thousands of spectators on the South Steyne Beach to a highly interesting and clever exhibition of board and ordinary surf-shooting." - Unaccredited: Kahanamoku in the Surf. The Sun, 11th January 1915, page 6. Myers: Freshwater LSC (1983) page 17. Given the generally smoother surf conditions of morning, the Freshwater exhibition was spectacular with Duke expressing some satisfaction with his performance. - W.F. Corbett: Kahanamoku in the Surf. The Sun, 12th January 1915, page 7. As well as body and board surfing, Duke gave instruction to two noted surf swimmers, Fred Williams, who had learnt his surf-shooting skills from Manly's Tommy Tana, and Harry Hay, who was also present at the previous Freshwater exhibition. "Messrs. Fred Williams, our champion surf shooter, and H. M. Hay, the speedy Manly swimmer, who 'did fifty-nine' in his heat of the inter-club handicap on the first day of the recent carnival, were invited by Kahanamoku to 'get aboard' with him, and they speak of the experience as thrilling. Harry Hay, Olympic swimmer (to his right). Note swimsuit drying on rail, left. Margan and Finney: Pictorial History (1970) page 112. Harry Hay, Olympic swimmer, to his left. "The change in the afternoon to go to South Steyne did not suit board-work so well, and the performer was consequently not seen to the same advantage as in the morning, still he gave an exhibition which apparently delighted the great crowd looking on." Futhermore, the display was mared by the appearance of a number of local surfers, most probably surfboard riders, eager to share some of the public recognition. "The breakers were favorable for the pastime, and the Honolulu champion made some magnificent returns to the shore standing on his big surfboard. Nevertheless, his performance was a revelation to the big crowd in the vicinity." Given the earlier contractual confusion in respect of the Swimming Association, the status of this day's events is unclear. While well attended and extensively covered by the press, they do not appear to have been promoted in the Sydney press, although there may have been some notice in the local papers. Critically, it is unknown if the Freshwater and Manly clubs, who no doubt played a significant role in organising the exhibitions, charged a fee to the spectators for what the Swimming officials would consider a "public performance", as was the case at the Dee Why and Cronulla carnivals in early February. For these appearances and Kahanamoku and Cunha's attendence at interstate swimming competitions the Swimming Association extracted a payment of £25. "During the Queensland, Melbourne and New Zealand visits the New South Wales Association is to receive £25 for each show taklng place." 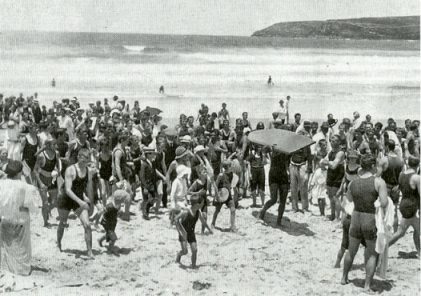 As the Dee Why carnival was described as the "first public appearance in the surf", it is possible that the exhibitions at Freshwater and Manly resulted from a combination of the enthusiasm of Duke and the local life saving clubs, and a desire by swimming officals to mitigate any residual public ill-feeling following the cancellation of the display of the 23rd December 1914. - Announcement of the upcoming Dee Why Exhibition. Unaccredited: Swimming - Kahanamoku's Return. Sydney Morning Herald, 3rd February 1915, page 3.
solid wood manner, January 1915. Reg Harris, Manly LSC (1961) page 66, and Nat Young, The History of Surfing (1983) page 47, record the date as "15 January 1915". This is not possible, on the 15th January the Hawaiian party was already in Brisbane preparing for a series of Queensland swimming carnivals. "Duke Kahanamoku, the celebrated swimmer from the Hawaiian Islands, and his swimming companion, George Cunha, and the manager of the tour arrived in Brisbane last night by the Sydney mail train." 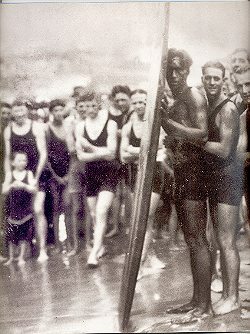 - Unaccredited: Swimming - Duke Kahanamoku - Arrival in Brisbane. The Brisbane Courier, Friday 15 January 1915, page 3. One of the earliest published retrospective accounts of the Freshwater exhibition on the 10th January was by C. Bede Maxwell in 1949. Her account of the offered assistance by the crew of the Manly surfboat has often been repeated, however there is no confirmation in any of the contemporary newspaper accounts and must be considered likely to be an embellishment. "... one Sunday morning, he was ready. A crowd came down to the beach and sighed to see that, with its usual perversity, the sea was big. Manly surfboat was making heavy weather of the trip around by way of Queenscliff. 'But why do we have the boat?' asked Kahanamoku curiously. When officials told him the boat was to tow his board out for him the Hawaiian threw back his handsome head and roared with laughter! He picked up his new board, ran with it down the beach, slapped it down on a wave and made his way out through the break." Maxwell's account also included tandem riding, the un-named companion likely to have been Isabel Letham. "Lastly he picked up a local girl to bring her in before him, tandem, to the shore. That, too, was something which had dismayed the orthodox when he had been the first at Waikiki to venture it; the feat involved the violation of the old taboo which denied boards and canoes to women." Similarly, this is not confirmed by contemporary newspaper accounts of either of the two Freshwater exhibitions or the one at South Steyne. While Letham did ride tandem with Duke in 1915, the only newspaper record of a public performance is at the Dee Why Carnival, a month later on 6 February 1915. - Unaccredited: Dee Why Carnival. Sydney Morning Herald, 8th February 1915, page 13. However it is highly probable that Duke and Isabel did, at the least, practice their tandem technique at Freshwater before venturing to make a formal public appearance. "Another achievement, so far alone mastered by him, is to take a passenger on the board with him." Also note that Maxwell's comment that "the feat involved the violation of the old taboo which denied boards and canoes to women" is strictly incorrect. Polynesian women were noted for their swimming and surfing abilities. Furthermore, Hawaiian legends suggest that a male and a female sharing a wave may have been considered a preliminary to courtship. -can not find my copy of this at present. (Marion Stell gives the same date Isabel Letham when recalling her tandem riding with Duke Kahanamoku in an interview with circa 1991.
records the date as ' 6 February 1915' after interviews with Isobel Lathem. - Stell: Pam Burridge (1992) page 7.) ???? This was not Letham's first public appearance in front of a large number of spectators. "Only two competitors- Miss Leatham and Miss Abrahams- started in the ladies surf race. The latter however gave up before the shore was reached, and had to be rescued." Sydney Morning Herald, 16 February 1914, page 13. "She afterwards denied that she had required the services of a life saver, stating that, having obtained a bad start, she was leisurely swimming ashore, and was rather annoyed at the attentions paid her by the life savers." - S.&G. Champion: Drowning, Bathing and Life Saving (2000) page 197. Citing Manly Daily cuttings February 1914 in the Dee Why LS&S Club minute book. "At camp 'Boomerang', ... Kahanamoku met enthusiastic youngster Claude West. West was to become the Hawaiian's star pupil. He learned how to balance his board in deep water and to develop skill in paddling, so necessary because a surfboard, like a surfboat, must take a wave at speed if it is to survive. Annexing the Australian championship in the same year, 1915, he successfully defended this until 1925, contemporaries swearing that surely young West had suckers on his feet." In 1915, there was no national surfboard riding championships, indeed any events in this period were best described as demonstration or display events. The earliest confirmed contest success by Claude West was substantially later- at the North Steyne Surfbathers Lifesaving Club carnival on Saturday 6 December 1919, he won the surfboard display competition with S. Dowling, also from Manly, in second place. Sydney Morning Herald, 8 December 1919, page 8. Despite numerous references to the surfboard riding exploits of several of those associated with the Kahanamoku exhibitions in the Sydney magazine The Surf (1917-1918), Claude West is not mentioned. Click image for detailed analysis. Accredited : 15 January 1915.
ii. Hall and Ambrose: Memories of Duke (1995) page 40. Accredited : Courtesy Heather Rose. The Hawaiian tourists left Sydney on the 11th January to travel north by train to commence a series of swimming carnivals in Queensland. "A change was made in the Australian itinerary arranged for Kahanamoku who is now well on his way to delight Queensland folk. He left by the Brisbane express yesterday afternoon to fufill eight engagements, which include shows at Allora and Rockhampton." Three days later, the journey presumably broken with an appearance at Allora, the party arrived in Bisbane on the 14th January. Brisbane Courier, Friday 15 January 1915, page 3. The tour extended the length of the state, beginning with three carnivals in Brisbane. Brisbane First Carnival, Saturday 16 January 1915. - SMH 18 January 1915 page 5. "On reaching the destination a large number enjoyed a delightful swim, which was enlivened by the use of a polo ball. The remainder enjoyed themselves with a football on the flat. The "Duke" preferred the latter pastime, at which he is no mean adept." - Unaccredited: Swimming - River Trip to Kahanamoku. Brisbane Courier, Tuesday 19 January 1915, page 3. Brisbane Second Carnival, Wednesday 20 January 1915. "The second of the Kahanamoku carnivals will be held in the Dock, South Bribane, to-morrow evening. - Brisbane Courier, Tuesday 19 January 1915 page 7. Brisbane Third Carnival, Saturday 23 January 1915. "Owing to the dock not being available the third and last of the Kahanamoku carnivals this will be held in the South Brisbane Baths this afternoon, commencing at 2.30"
- Brisbane Courier, Saturday 23 January 1915, page 6. Rockhampton, Thursday 29 January 1915. "A successful swimming carnival was concluded to-night, Duke Kahanamoku, George Cunha, Eric Pearce, and Sewell participating." - Unaccredited: Hawaiians at Rockhampton. The party returned by train to Brisbane on Wednesday 3 February and the following day embarked on a coastal steamer for Sydney. "The members of the Hawaiian party, Duke Kahanamoku, George Cunha, and Francis Evans (manager) - arrived by yesterday's mail train from Mt. Morgan and Rockhampton, and spoke appreciately of the treatment given them. They continued their journey south by the Osterley, which left the New Farm Whalf at 11 o'clock yesterday." -Unaccredited: Swimming - Depature of Kahanamoku. The Brisbane Courier, Thursday 4 February 1915 page 3. While there some unaccounted days in the itinerary during the ten day stay in Brisbane, there does not appear to be any indication that Kahanamoku travelled to the coast to experience the Queensland surf. Return to Sydney from Brisbane, 5th February 1915. "Messrs. D. P. Kahanamoku, George Cunha, and Francis Evans, the Hawaiian Swimming Team, who have been touring Queensland, returned to Sydney yesterday morning by the Osterley." - Unaccredited: Swimming - Kahanamoku returns. Sydney Morning Herald, 6th February 1915, page 18. While Duke Kahanamoku was touring Queensland, his boardriding exploits in Sydney continued to have an influence, sometimes not without controversy. "Despite the continual outcry against surf-boards, the dangerous aids to shooters are still being used, and one last night at Coogee hit Mrs. Martha Green, aged 60, with such force that she is now in Prince Alfred Hospital with her right leg broken in two places." - Unaccredited: Surf Board Injury. The Sun, 24 January 1915, page 4. "Last night Alderman Railton drew the Manly Council's attention to the dangers resulting from the careless use of surf boards at South Steyne." - Unaccredited: Dangerous Surf Boards. The Sun, 29 January 1915 page 2. "A new mark for the 100 yard swim has been set by Duke Kahanamoku, the Honolulu champion, according to word received here today from Sydney, N.S.W." - Unaccredited: New Swim Record. New York Times, January 26, 1915, Tuesday, page 9. The Dee Why Carnival, 6 February 1915. Surf Carnivals were already established as fund raising events for the Surf Life Saving movement and the Duke's appearance at Dee Why, which attracted a huge crowd, included the standard fee of £25 paid to the NSW Swimming Association. 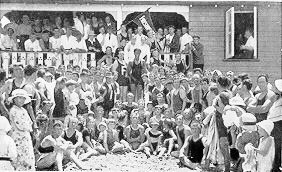 "Dee Why Club ... spent a lot of money to engage Duke Kahanamoku ... proving such an attraction to the paying public that in the thirty years afterwards the club did not succeed in matching that day's takings." - Maxwell: Surf (1949) page 207. An announcement of the upcoming exhibition noted that it would include a tandem surfing display, with Isabel Letham. "The champion sprinter and surf-board exponent will make hls first public appearance In the surf at the Dee Why Club's carnival, and if the waves be at all suitable, his exhibitlon of board-rldlng in various attitudes should be worth witnessing. Another achievement, so far alone mastered by him, is to take a passenger on the board with him." - Unaccredited: Swimming - Carnival Activity. Sydney Morning Herald, Wednesday 3rd February 1915, page 3. The Dee Why carnival was covered by all the Sydney papers. The Daily Telegraph rported on Duke's skills, including tandem riding. It also estimated the size of the crowd of spectators and the length of the demonstrations, but apparently over-estimated the length of the board. "Duke Kahanmoku treated something like 4000 persons to a fine exhibition of surf board shooting at Deewhy on Saturday afternoon. For more than an hour exhibitions were given." The Daily Telegraph, 8th February 1915, page 4. The reporter for the Sydney Morning Herald was similarly impressed and named Duke's tandem partner. "He came out with his surf board, plunged into the water and continued to swim out until those watching from the beach soon wondered when he would stop. Kahanamoku remained in the surf for nearly an hour, and he was accompanied at intervals by Miss Letham, of Freshwater, and it was a rare sight to watch both swimmers on the surf board." - Unaccredited: Kahanamoku and His Surf Board. The Sydney Morning Herald, 8th February 1915, page 13. "Dexterity and Skill Win the Title 'Blondin of the Surf' "
Blondin, also known as Chevalier Blondin, was born as Jean Francois Gravelet in France in 1824, and gained a world-wide reputation as a tightrope walker when he successfully crossed Niagara Falls in June 1859. "At the time the Hawaiian put out to sea with his surf-board, which he seems to worship almost as much as a child its doll, the waves, unfortunately, were not particualy good for shooting purposes, merely an occasional one having any length of run. It was a thrilling sight to watch, and such balancing skill and dexterity entitles him to the designation of a surfing Blondin." "A young lady acquaintance then emerged and accompanied the Duke seawards. But the question arises whether the onlookers, many who had come from distant suburbs, would not have been better pleased to have been treated to a greater number of performances like the first, rather than have to submit to the wearying wait that occurred before the Duke found it possible to bring off the more difficult stunt." - Cecil Healey: Duke in the Surf. The Referee, 16 February 1915, page 1.
courtesy of The White Creamy Ponies. i. Warshaw:Surfriders (1997) page 18.
ii. Kampion:Stoked (1997) page 40. The White Creamy Ponies was apparently a "taxi" company serving the Manly area, with a long association with the local surf lifesaving movement. "The white creamy ponies and carriages of Manly took up the van of the procession and were occupied by Mr F. W. J. Donovan (president), Mr A. W. Relph (secretary) and the committee of the club." The Sydney Morning Herald, Monday 21 March 1910, page 10. The next day Duke Kahanamoku and George Cunha were at Cronulla Beach. "Duke Kahanamoku, the 100 yds. world's champion swimmer, will visit Cronulla Beach on Sunday afternoon and will give an exhibition at 3 o'clock. At the invitation of the Cronulla Surf Club he will visit the beauty spots of the Sutherland Shire." The Propeller, Friday 5th February 1915, page 1. There was a similar announcenent the following day in The St. George Call, Saturday 6th February 1915, page 5. The Cronulla Club undertook extensive preparations to ensure the day was a success and to suitably honour their guest. 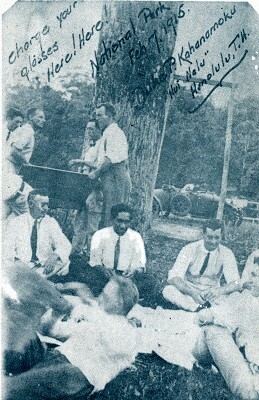 Upon leaving the steam train at Sutherland, Duke Kahanamoku, George Cunha and Francis Evans accompaned by Harry Hay, W.W. Hill and Don McIntyre, were welcomed to the district by Club members and then transported in members' cars to Audley via Waterfall and Lady Carrington Drive. After lunch at Audley, the party travelled by ferry to Cronulla for the surfing activities. "An alarm reel race was held, between the Duke, Cunha and Hay, the linesman being made up of the clubmen. One wants to try and stand on that unstable piece of wood, even in smooth water, to appreciate fully the sight of that bronze statue tearing in through broken and choppy seas." "Tea was held in the new pavillion and the party adjourned to the captain's house for a couple of hour's music, the Duke and George Cuhna rendering an item in Hawaian (sic), the Duke providing the accompaniment on his eucalalia (sic, ukulele)." According to W. G. Marshall, one of the boards shaped by Duke after the sugar pine Freshwater board made its way to Cronulla, the property of ex-Manly surf-shooter, Ron “Prawn” Bowden. 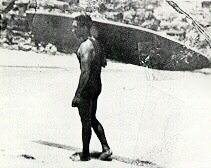 Duke Kahanamoku, Cronulla Beach 7th February 1915.
iii. Thoms:Surfmovies (2000) page 22. Possibly Cronulla SLSC Newsletter, circa 1960. 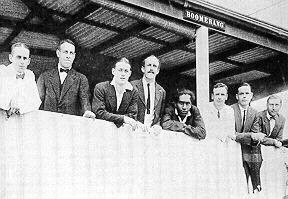 One of the first famous international visitors to the Club (Cronulla) was Duke Kahanamoku, the world famous exponent of surfboard riding and at present a prominant civic dignitary of Honolulu. The Duke and his party were welcomed to the district by the club on leaving the steam train at Sutherland. Through the generosity of club members, F. Stroud, J. Hallet, J. Munro, L. Giddings, N. Bouffier and J. Hill Sr. making their cars available the visitors were transported to Audley via Waterfall and Lady Carrington Drive. After lunch at Audley, the party joined the ferry to Cronulla, hence to the beach for surfing. Tea was arranged in the Park Pavillion after which the party returned to Sutherland for the farewell ceremony. The visit of this famous surfer also had effect on the local talent. Jack, chivalrous character that he was, gave it to a certain beautiful surf siren but alas she married another (ungrateful hussey, recalls Jack). Image cropped from Warshaw : Surfriders (1997) page 16. 1. Indicates the importance of the visit to club members. 3. Indicates Sydney "surfboard exponents" existed on the southern beaches before 1915. 4. Duke Kahanamoku's Cronulla board was subsequently ridden by at least three other riders. The article is probably taken from a Cronulla Surf Life Saving Club history, printed circa 1960 for the club's 50th anniversary (started 1909). Similar publications, jointly published/funded with the ASLA, are known for Manly (Harris), Freshwater (Myers), Deewhy (Thomas) clubs and the Illwawarra branch (Middleton). It is less probably from retrospective article in a small print run Club magazine or newsletter. 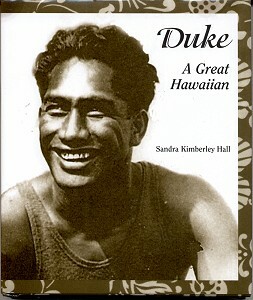 The detail and familiarity of the author with the participants indicate the text was probably transcribed within 50 years of the events, Duke Kahanamoku entered public office in 1934, and left in 1960, he suffered heart problems in 1956 and 1962 and died in 1968. Hence the document is dated circa 1960. Ferry, Audley to Cronulla Surfing demonstration followed by tea at the Pavillion,Cronulla. Return by ferry. 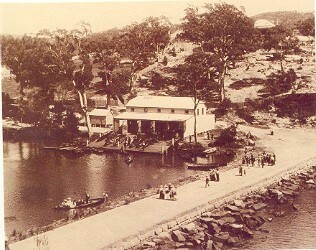 Audley Boatshead and Weir, circa 1900. Audley, Royal National Park, 7 February 1915. On the way to the Cronulla exhibition. Souvenir of the Sutherland Shire. As the years rolled by, the sport gained momentum. Cronulla was the mecca for aquaticians of all countries. Here is the famous Hawaiian champion, Duke P. Kahanamoku (centre) with friends at National Park. Mr. Jack Hallett, famous Cronulla motor-boatman and aquaplanist:, took "the Duke" under his wing during his visit to the Shire in 1915." Cronulla Beach, 7th February 1915. 2. Kampion: Stoked (1997) page 40. 3. Thoms: Surfmovies (2000) page 22. Cronulla beach, circa 1905. Longhurst: Lifesaver (2000) page 17. Drummoyne Carnival, 8th February 1915. The Drummoyne Carnival was the last official performance by Kahanamoku and Cunha in Sydney before finishing the tour with events in Newcastle, Melbourne and Goulburn. Newcasle Gala, 10th February 1915. - The Sydney Morning Herald, Thursday 11 February 1915, page 13. E. S. Marks was a prominant figure in many Sydney sports. Sydney's premier athletic track is named The E.S. Marks Field. The card was signed following the return to Sydney from the Newcastle carnival. Melbourne Visit, 12 - 13 February 1915. "The Duke looked very fit as he left for Melbourne. The Duke likes the surf play here; though it is different to carvorting on the waves at Honolulu." The Referee, 17 February 1915, page 16. The visit to Bondi was most likely for body surfing. "The display given by T. Walker on a "Duke" surf board was very good indeed. The canoe and surf boat competitions provided some good exhibitions." - Unaccredited: Swimming - Kahanamoku's Records. The Sydney Morning Herald, Wednesday 17 March 1915, page 8. 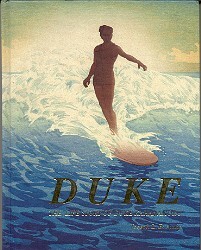 The reference to "a 'Duke' surf board" probably means a Duke Kahanamoku type board, at a remote possibility, a new redwood board shaped by Duke himself. The same day The Referee published a surfriding photograph from Waikiki. THIS WHITE GIRL IS SAID TO BE THE ONLY GIRL SURF-BOARD EXPERT IN HONOLULU. 13th February 1915, page 11. Goulburn Carnival, 17 February 1915. Patriotic Carnival and Surfboard Auction, 19 February 1915. Early in the tour, swimming officials attempted to add a further Carnival to the itinerary, the funds to be contributed the the war effort, but due to the realignment of the dates in the New Zealand programme, it it not eventuate. However, a newspaper report indicates that Duke (and possibly Cunha) made a number of, probably redwood, surfboards while in Sydney. "The executive had practically arranged another of raising a sum for patriotic purposes for Friday 19th, at which the Hawaiian party were to be made the means of adding to the price of admission by auctioning several surf boards made by themselves; but the departure of the Wellington boat on Friday, 19th February, instead of Saturday the 20th, has also made this impossible." The Hawaiian party left Sydney on the Moerake for New Zealand on the 19th February for a series of swimming carnivals. With some expectation that the New Zealand tour may also entail public interest in surfboard riding exhibitions, it is possible that Duke took a redwood board with him from Australia, the sugar pine Freshwater board being left with the Walker brothers. "The introduction of a surf board exhibition during the latter competition was a good move, and brought out three very fine exponents." - Unaccredited: Swimming - Surf and Other Carnivals. The Sydney Morning Herald, Wednesday 24 March 1915, page 8. New Zealand, 20 February - 23 th March 1915. The first week in New Zealand saw three swimming events held in Auckland. "Kahanamoku, Cunha, and Evans will compete at Auckland three times this week, and they will leave New Zealand on March 23 by the R.M.S. Niagara for Honolulu." "... Hawaiian swimmer and surfer Duke Kahanamoku toured New Zealand in 1915. He gave demonstrations at Muriwai on Auckland’s west coast, Lyall Bay in Wellington, and New Brighton beach in Christchurch.". Nancy Swarbrick: Lifesaving and surfing - The rise of surfing. The Grey River Argus, clearly following the reports in the Sydney press, detailed Duke's surfing exploits across the Tasman and indicated the prospect of a similar display in New Zealand following the first Wellington carnival at the Te Aro Baths, Wellington, on 24th February. "On a surf-board Kahanomoku is supreme. Wellington swimmers will probably have an opportunity of seeing Kahanamoku on a surf-board at Lyall Bay on the Sunday following his appearance in Te Aro baths." - Unaccredited: Duke Kahanamoku's Visit. Grey River Argus, 3 March 1915, page 3. "A record Sunday crowd attended Lyall Bay yesterday, in order to see the famous swimmer, Duke Kahanamoku, in the surf. By careful steerlng he prolonged the shoot for a distance of 150 to 200 yards." Evening Post, Volume LXXXIX, Issue 56, 8 March 1915, page 6. The Hawaiian party travelled to the South Island, for further swimming events and Duke gave another surfing demonstration at Brighton Beach, Christchurch. "This photograph shows him either body surfing or preparing to stand on a board in the surf at New Brighton beach, Christchurch." As in Australia, the surfboard riding demonstrations by Duke Kahanamoku had an immediate impact on New Zealand surfers. "Surf-riding is becoming more and more popular at Lyall Bay, Wellington. Now it is an every-day sight to see many bathers with surf-boards, disporting themselves more or less skilfully on the breakers." Remarkably, Duke Kahanamoku's surfboard riding displays in Sydney far exceeded their influence on local surfers. One of the exhibitions was filmed for the cinema magazine Australasian Gazette and was presumably shown around the country, including at Spencer's Pictures at Launceston in March 1915. "The 'Australian Gazette' embraces the following topical subjects:- Sydney-Delfosse Badgery, the Australian aviator, does some most sensational flying at Victoria Park, including bomb-dropping. Melbourne- The state championship carnival; Duke Kahanamoku gives exhibitions on the surf board; and cartoons by Harry Julius, which form an entertainment by themselves." Examiner (Launceston), Tuesday 16 March 1915, page 6. The segment is accredited as "Melbourne", probably because it was included with footage of Duke at the Victorian "state championship carnival". Unfortunately, the film is apparently now lost. "The members of the Bondi and North Bondi Surf Clubs have combined to hold a monster surf and beach carnival in aid of Jack's Day at Bondi Beach on Saturday afternoon next. The programme will include exhibitions of surfboard riding by pupils of Kahanamoku, and sensational canoe races through the breakers." The Sydney Morning Herald, Tuesday 29 October 1918, page 6. In-depth coverage of the many facets of Duke Kahanamoku's life story, including his Olympic career, film work in Hollywood and surfing around the world. Australian surfing exploits pages 36 to 45 - also note photographs on pages 12 and 13. Many of the images are found in a multitude of publications, though some are very rare. The historical format is slightly jumbled and there seems too much reliance on the input of wife, Nardine, who he did not meet and marry till 1940. Good, but still not the definite work on Duke Kahanamoku. Geoff Cater (1999 - 2015) : Duke Kahanamoku in Australia, 1914-1915.